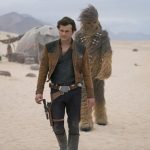 Solo: A Star Wars Story swoops into theaters like the rakish smuggler himself—underestimated and with a reputation for trouble. Happily, this backstory for the space flyboy also is like its namesake in other ways: funny, surprising, and good at heart. 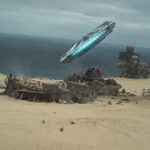 When Lucasfilm parted ways with the film’s original directors Phil Lord and Chris Miller (The LEGO Movie, 22 Jump Street) over creative differences last year, many a fan no doubt thought, “I’ve got a bad feeling about this.” But the confident finished product shows no sign of any bumps along the way. 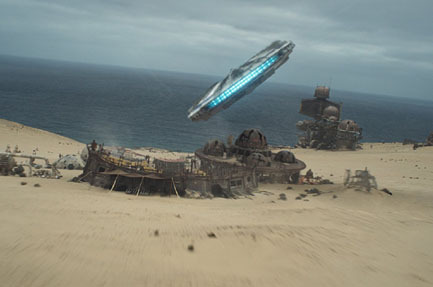 Director Ron Howard (In the Heart of the Sea, Apollo 13) and cinematographer Bradford Young deliver an old-fashioned jolt of Star Wars joy a la A New Hope, complete with lush vistas, rollercoaster flight sequences, and seedy hives of scum and villainy. Alden Ehrenreich (Hail, Caesar!) has the unenviable task of stepping into the boots that Harrison Ford made famous more than 40 years ago. But like Chris Pine, who adds enough nods to William Shatner to make his younger Capt. Jim Kirk believable yet uniquely his own in the Star Trek reboots, Ehrenreich soars. His Han isn’t quite the wisecracking everyman that Ford was—but he wants to be. He’s got that distinctive smirk, trouble with authority, and a knack for talking his way out of a jam, but his cockiness is more a veneer than bone-deep. A youth who grew up on the streets, he acts tough to hide his vulnerabilities around the rougher types he wants—and needs—to emulate in order to survive. The script by Jonathan Kasdan (Dawson’s Creek) and Lawrence Kasdan establishes Han as pretty much alone from the start. 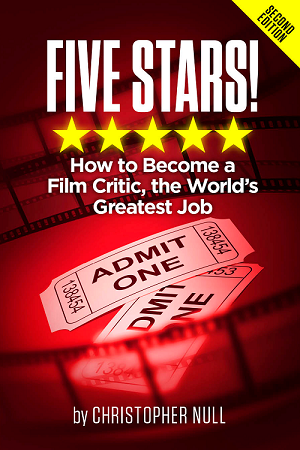 (The elder Kasdan knows these characters inside out, having penned The Empire Strikes Back, Return of the Jedi, and The Force Awakens.) Young Han and his sweetheart, Qi’ra (Emilia Clarke of Game of Thrones), steal for a crime lord in exchange for food and shelter. (Think Oliver Twist with hovering speeders.) Han decides one day to keep a capsule of coveted fuel to pay their way off Corellia, but he and Qi’ra are separated. He vows to return to find her again. Desperate to fly, he joins the Imperial army, which assigns him to the infantry. A few years later, Han is no way near leaving the ground, chafing at orders, and intrigued by a guy on the battlefield who saves his neck. Tobias Beckett (Woody Harrelson, Three Billboards Outside Ebbing, Missouri) is really a thief and smuggler disguised as an Imperial. Han—and later Chewie (Joonas Suotamo, who’s played the beloved Wookie since The Force Awakens)—fall in with Beckett’s group of scoundrels, intending to pull off one more job to score enough money to do what they like. Watch enough heist movies, and you know that something inevitably goes wrong, and one more job is never enough. Of course, Qi’ra turns up again, this time in the employ—and perhaps more—of crime syndicate head Dryden Vos (Paul Bettany, Avengers: Infinity War). Clarke plays Qi’ra with quicksilver moods. Does she still have feelings for Han? He naively can’t hide his but should. 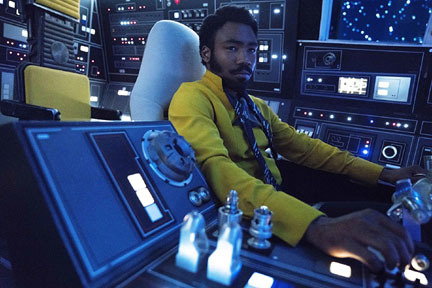 The group enlists the help of pilot Lando Calrissian (Donald Glover, Atlanta, Spider-Man: Homecoming), who owns The Millennium Falcon, still crisp white at this point (and with a walk-in cape closet). Glover is a hoot as the sometime friend whom Billy Dee Williams embodied in the later Star Wars films. “Everything you’ve heard about me is true,” he says smoothly over cards. Aliens with multiple eyes stray for a peek at the other players’ hands. 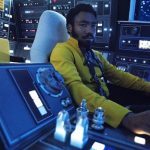 Lando’s droid copilot, L3-37 (Phoebe Waller-Bridge, Goodbye Christopher Robin), has a focus on rights and autonomy that leads to amusing payoffs. But the film’s spine—its real love story, if you will—is between Han and Chewie. Ehrenreich and Suotamo develop the rapport in Solo that fans love in the later films, as these two loners find someone they can depend upon. There’s a nice moment when they talk about achieving that freedom both of them desire. “Yeah, been a while for me, too,” Han says, interpreting Chewie’s speech. Solo’s plot about stealing fuel is a bit convoluted, but the film generates solid suspense through a train heist and later a flight through the famed Kessel Run. That’s no small feat, considering the audience knows at least a few characters that live to fight another day. 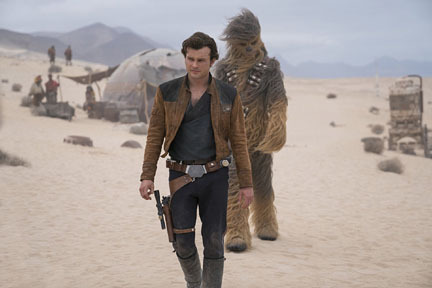 Overall, Solo fleshes out a solid past for a guy who learns to trust less and still has enough goodness within to join up with a galactic rebellion later. Plus, it knows when to let some moments breathe. When Han finally lands in the pilot seat, his face lights up not just from the Falcon’s glow, and we’re flying right along with him.